Just the way a varied food diet aids optimal physical health, I believe a varied educational diet is best for kids. With literacy, that means I advocate children having a range of formats and genres to read, and that they try writing in different formats and styles too. 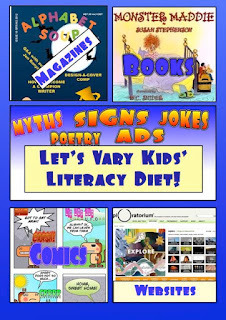 Do your kids have access to a wide range of reading material? Fiction and non-fiction books can be found at your local and school library, as well as in book stores and charity shops. Letting kids choose their own books gives them ownership over what they read. Owning books as well as borrowing/returning them is great so that some books become old friends. Non-fiction can include poetry, autobiography, biography, myths and legends, crafts and wonderful factual books about a wide range of subjects. 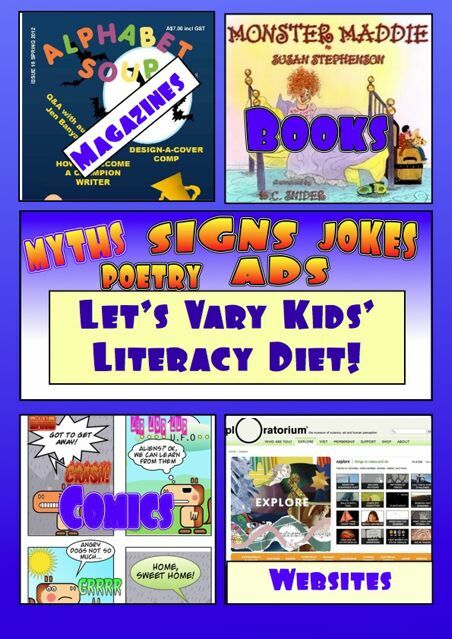 Do your kids read magazines, catalogues, flyers, selected sections of newspapers, websites, graphs, tables, charts, maps, timetables, recipes, songs, jokes, riddles, captions, signs and advertisements? Some children will need help in understanding the layout and conventions of different formats. Time spent explaining and practising the use of such things as bus timetables really helps kids' functional literacy. As children learn the skill of writing groups of letters to make words and then sentences, we mostly let them get on with this difficult task. But when they've mastered the physical and mental skills of writing, we encourage them to notice the different purposes and kinds of texts. Often in school, the kind of reading material studied will also be the kind of writing format studied. It makes sense when a child is examining recipes to determine features of the recipe format or text type, to help the child write his own recipe too. At school, kids will study different text types, those that are imaginative, informative and persuasive, or a combination. Children need to think about the audience they're writing for, and what their purpose is for writing. Articles I've published about children's writing include Children's Writing - Write a Procedure, How Do Kids Write a Book Review and Get Kids Writing with Lists. One way to vary writing time is to have children write with different implements and on different papers, have them create their own books for writing in, have them use a keyboard, and have them try different word processing software. I love the comic editors available online that encourage children to make little digital stories. Such activities link fun and writing, something I think is important if we want kids to love to write. Of course, today we've only looked at reading and writing. Texts can also be spoken or listened to, and they can be multimodal. But when read o'clock and write o'clock roll around each day, let's enrich our children's lives by helping them encounter a range of different reading and writing materials and types. Great post, and timely for me as I'm currently planning a session with some 7 year olds which is all about different sorts of reading. @Playing by the bookLucky 7 year-olds! Thanks for the reminder! I love what comic books offer kids, and also love the comic editors that help kids make their own digital comic books. I have a ton of posts about these if you're interested JB.